A North Carolina saltwater fishing license, also referred to as a Coastal Recreational Fishing License (CRFL), is required for all anglers who are 16 or older. The cost for a fishing license varies based on the amount of time a license is good for, as well as the applicant's residence status. Generally, an NC resident can acquire a 10 day license for $5, while an out-of-state resident can purchase a 10 day license for $10. Annual licenses are also available for $15 or $30, and lifetime licenses can be purchased as well, with special discounts incldued for youths, residents, and disabled veterans. Fishing Licenses can be easily picked up online at the North Carolina Wildlife Resources Commission's website at http://www.ncwildlife.org//. They can also be obtained while on the island at the Tradewinds Tackle Shop in Ocracoke Village. With that being said, many longtime visitors and locals attest that the best beaches for surf fishing are 4WD accessible beaches that are located along Ocracoke and Hatteras Inlets. These beaches are anywhere from .5 miles (Hatteras Inlet) to 3-4 miles (Ocracoke Inlet) from the nearest paved parking area, and are thereby hard to get to without a 4WD vehicle. In order to drive on the beach, visitors will need to obtain a Beach Driving Permit. These permits are granted by the National Park Service (NPS) and are available in 7 day increments for $50 or for a full year for $120. Visitors can pick up a beach driving permit while on the island at the Ocracoke Visitor Center at 40 Irvin Garrish Highway, or can purchase and reserve a permit online, which can then be mailed or picked up while on the island. The online reservation process for a beach driving permit is fairly new, and visitors can learn more about this process at the NPS website at http://www.nps.gov/caha/planyourvisit/permitsandreservations.htm#ORV/. Note that visitors who apply for a permit in person will be required to watch a 7-minute video on the do's and don'ts of beach driving. Applicants will also be required to show their driver's license, vehicle registration, and the previous year's beach driving permit, if applicable. Visitors should also note that some popular fishing beaches and access ramps, including those that access the inlets, may be closed during the summer months due to nesting activity. Visitors can stay up-to-date on open Ocracoke Island beaches by checking the NPS beach access map at http://www.nps.gov/maps/full.html?mapId=0c53eca8-fd01-40ef-b809-41f814fe5efc. The beaches off of the Hatteras and Ocracoke Inlets are considered the best regions for surf fishing, as these regions attract big game species throughout the year. By casting off the beach, anglers can catch huge spring and fall drums, sharks, bluefish, flounder, Spanish mackerel, pompano, spots, croaker, and sea mullets on a regular basis, depending on season. Local Outer Banks tackle shops, like Tradewinds Tackle in Ocracoke, can serve as valuable resources for what's in season along the beach. The spring and fall months are considered the best time for surf fishing, but summertime visitors will have good luck as well, especially when it comes to blues and sea mullets. While there are two operational fishing piers on neighboring Hatteras Island, there are no fishing piers on Ocracoke Islands. Offshore, visitors can reel in the big game and prize fish, including marlin, dolphin or Mahi Mahi, red snapper, amberjacks, and Yellowfin Tuna. Because Ocracoke Islands is just 12 miles or so away from the Gulf Stream, getting to the offshore waters is a relatively easy venture. On the soundside, anglers can wade out a few hundred feet and start shuffling their toes in the shallow waters to unearth a large number of fresh clams that are perfect for steaming and eating.Oysters are also popular in Ocracoke, and crabbing is fruitful as well, especially via a soundfront or harborfront dock. The beaches of Ocracoke Islands are home base to one of the biggest surf fishing tournaments in the Outer Banks, the Annual Ocracoke Invitational Surf Fishing Tournament. This tournament has been going strong for 30+ years, and is a fun competition among roughly 70 teams that begins with a kick-off party, and ends with an awards ceremony with coveted prizes. Held in early May and lasting 2-5 days, the Ocracoke Fishing Tournament effectively hosts around 420 anglers and their supporters every year. Fishermen can also head south across the ferry to Hatteras Island, which is home to some of the oldest fishing tournaments along the Outer Banks. These tournaments include the Cape Hatteras Anglers Club Tournament and NCBBA Frank and Fran's Red Drum Tournament. Both of these competitions are held in the fall, and have been popular with visiting and local anglers for decades. Silver Lake Harbor is home to a handful of fishing charters that take anglers out to the offshore Gulf Stream waters, or to the fruitful waters that lay just off the beaches and soundside. There are roughly just under a dozen fishing charters that operate out of Ocracoke, and which can be reserved for half day or full day trips. The cost to book a charter varies both on the length of time and the targeted area. Inshore charters are noticeably cheaper, and on Ocracoke Island, are a solid trip for anglers who want to reel in a large number of tasty game fish without the excess cost of the 12-mile trip to the Gulf Stream. Of course, when it comes to big game fishing, the Gulf Stream is the optimal choice, and charter businesses on Ocracoke Island can target a wide range of big species from blue and white marlins, to shimmering dolphin and snappers. 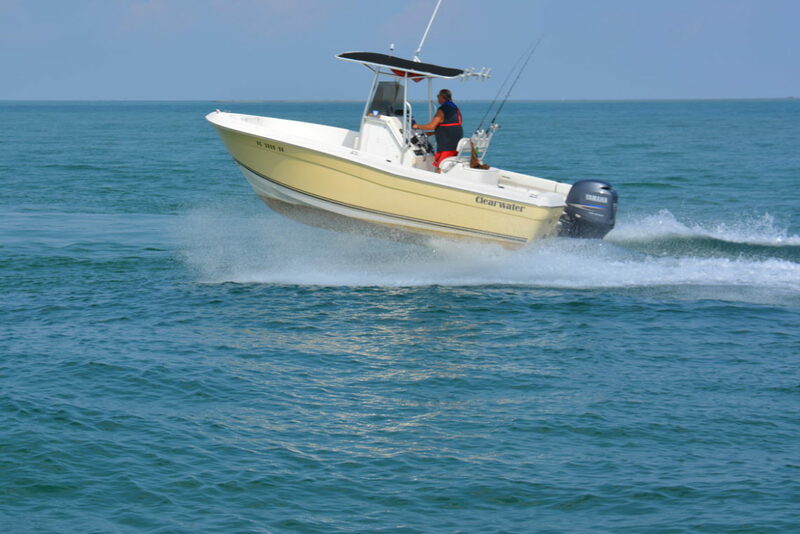 Because of the popularity of fishing on Ocracoke Island, and the limited number of charters available that launch from the village's waterfront, anglers are advised to book as well in advance as possible. Most charter fishing vessels can accommodate parties of 1-6, and small groups of anglers can occasionally join other small parties for extra savings and last minute trips. Ocracoke visitors can also head to the village of Hatteras via the Ocracoke / Hatteras ferry, which is home to dozens of acclaimed fishing charters. Anglers should note that because most fishing charters leave between 4:00 a.m. and 6:00 a.m. in the morning, and the earliest Hatteras / Ocracoke ferry crossing is 5:00 a.m. or later, an overnight trip may be required to embark on a Hatteras Village fishing charter. Even so, both Hatteras and Ocracoke Islands offer some of the easiest access to the Gulf Stream, with charters that are spearheaded by some of the most experienced local captains. For that reason, and the added bonus of the incredible inshore fishing, Ocracoke and Hatteras fishing charters are hard to beat on the Outer Banks.